Hesperantha is a cormous genus in the Iridaceae family with 79 species. Four are found in tropical Africa, 37 in summer-rainfall southern Africa, and 42 in winter-rainfall southern Africa. Many of the former are found in the eastern southern African Drakensberg in KwaZulu-Natal. 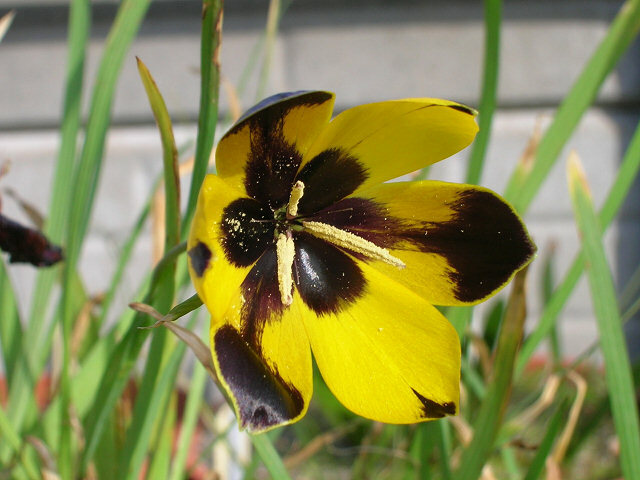 In spite of the large number of species there is limited variability in the floral structure. Flowers are radially symmetrical with a style that divides at the mouth of the tube into three branches that spread over the tepals. Most plants are short, 15 to 20 cm. tall or less. A number of them open late in the afternoon or early evening and those are often very fragrant. 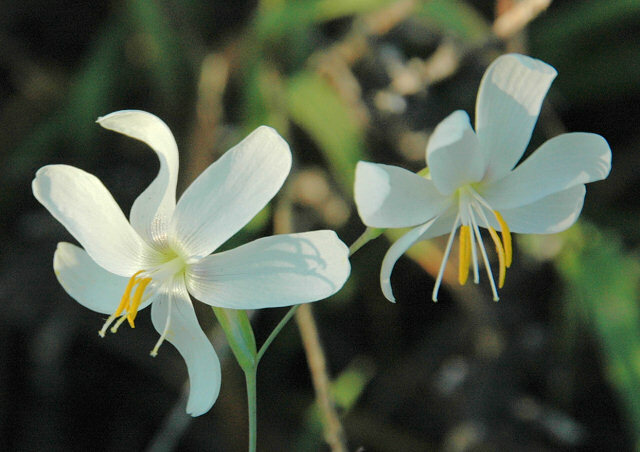 Peter Goldblatt, Ingrid Nänni, Peter Bernhardt, and John C. Manning studied the pollination of many of the species in a paper entitled Floral Biology Of Hesperantha (Iridaceae: Crocoideae): How Minor Shifts In Floral Presentation Change The Pollination System. They divided the species into four groups. 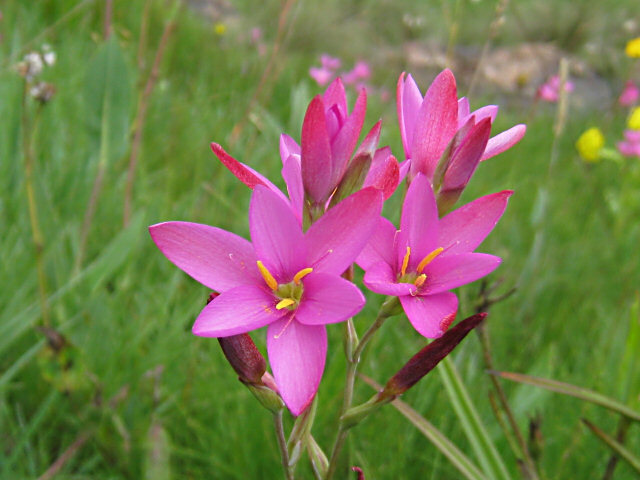 The first group, named the Hesperantha pauciflora group has a short perianth tube, is pink and open during the day. Flowers in this group are pollinated by bees and in the winter rainfall area occasionally beetles and short probscid flies. The second group named after Hesperantha falcata or Hesperantha cucullata has whitish flowers, often with reddish pigment on the outside of the outer tepals with a short perianth tube. Flowers are open during the day or more commonly late in the day and last into the night. Some species (day time bloomers) are pollinated by long-tongued apid bees and other species (those blooming at night) by noctuid moths. Some species are pollinated by both. 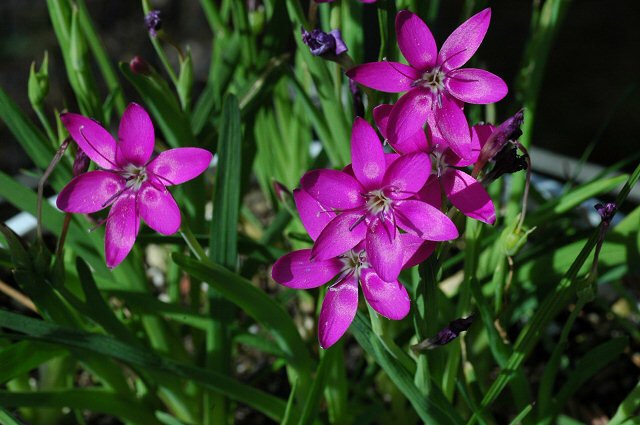 The third group has a long perianth tube and is pink and open during the day and is represented by Hesperantha latifolia or Hesperantha woodii. Flowers in this group are pollinated by long proboscid flies. In a group all its own is Hesperantha vaginata with a cupped perianth, bright yellow flowers with contrasting markings open in the middle of the day and pollinated by hopliine beetles. 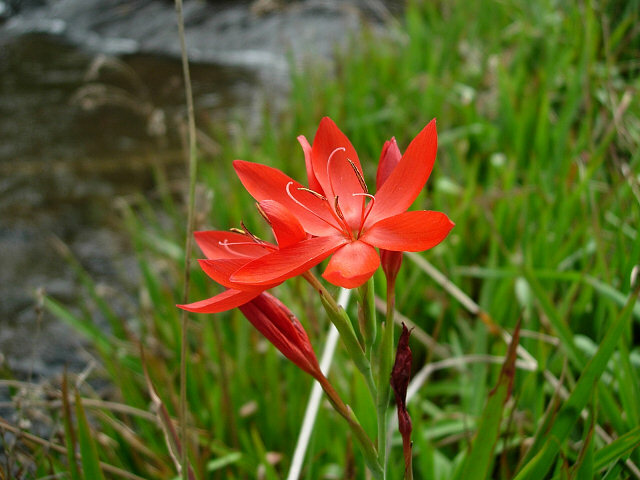 Another exception is the only rhizomatous species, Hesperantha coccinea syn. 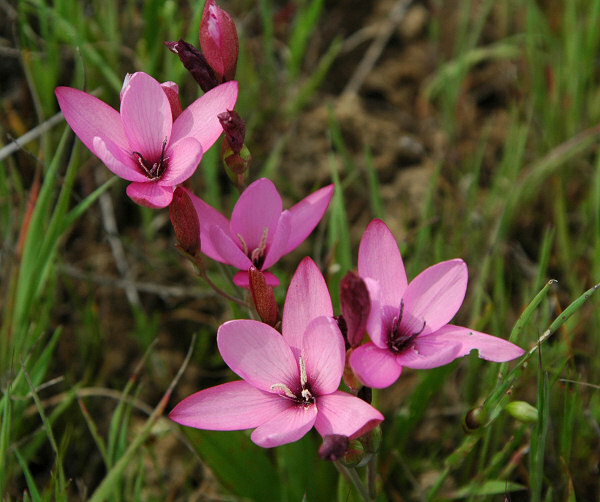 Schizostylis coccinea. The red form of this species is pollinated by butterflies.